DeFever Cruisers - A Club for Yachting Enthusiasts with a Passion for DeFever Vessels and the Cruising Life! 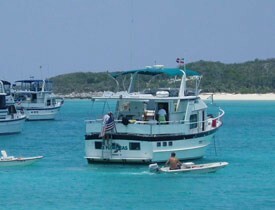 Ron and Charma Owens were anchored off Sampson Cay in the Exumas, a fabulous chain of islands in the Bahamas. Nearby were two other DeFever 44's, Floriseas, with Bob and Andrea Utter aboard, and Bob and Barbara Dein on their Gondola. Early in the morning, Bob Utter called on the radio to say, “My Heart 3000 inverter has failed and I can’t charge my batteries without running the main engines. We are going to up-anchor and head back to Nassau to find a replacement.” Ron answered, "Bob, I have a spare Heart 2000 stored on board as a backup, I will bring it over." Before we could leave the VHF channel, Bob Dein chimed in with, "I have a backup Heart 2500 aboard, would you rather have it?” Needless to say, we both went over to assist with the exchange of inverters. We discovered that the problem was actually the heavy-duty internal DC switch inside the inverter. No problem, Floriseas happily operated for a few months with a spare inverter, and never missed a beat. It sure is handy to have a DeFever or two nearby..